Revolution 2020 is an engaging tale of two best friends who fall in love with the same girl. The novel is set against the backdrop of rampant corruption, which one friend yields to, but the other fights. The novel is set in Varanasi. Chetan Bhagat initiates the story through the central character Gopal. It is through Gopal’s narration of his life to the author that we are introduced to Raghav and Aarti. The story revolves around these three characters. While Gopal comes from a poor family, Raghav comes from a well-off family. Both set out to achieve success and realise their dreams. While Gopal’s main motive is to seek financial wealth, Raghav has always wanted to bring in a revolutionary change in the political arena of the country. As circumstances may have it, both the boys fall in love with the same girl, Aarti. However, Aarti eventually falls for Raghav. The climax of the story reaches its peak when Aarti harbors feelings for Gopal too. Who will she finally choose? In the meantime, Gopal, through unfair means and with the help of a corrupt politician Shukla, starts an engineering college. Raghav goes on to become a successful journalist and begins to use this power to expose Shukla’s wrongdoings. It is indeed an interesting tale that has been realistically depicted against the background of a real world where corruption looms large. It brings to light the corrupt system of education in India. 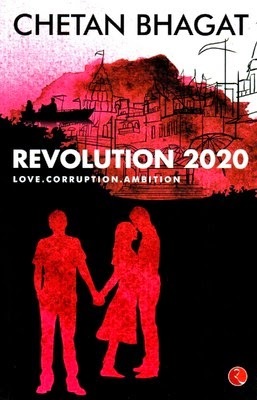 Revolution 2020 was published in 2011 and turned out to be a bestseller. Chetan Bhagat is an ex-student of the Indian Institute of Technology, Delhi, and the Indian Institute of Management, Ahmedabad. Chetan Bhagat has many bestselling novels to his credit such as One Night @ The Call Center, 2 States, Five Point Someone and The 3 Mistakes Of My Life. His writing style is simple and informal. Chetan Bhagat is an investment banker by profession. Though he is well known as an Indian author, speaker and columnist, he is seen more as India’s youth icon. He has also been listed in the category of 100 most influential people in the world by Time magazine. He also writes columns for Dainik Bhaskar and Times of India. Four of his books have been adapted into films. He is presently resides in Mumbai with his wife and two children.